543 and 633 nm. Mean amplimer values from triplicate measurements were used to calculate 10 individual NFSs per genotype. 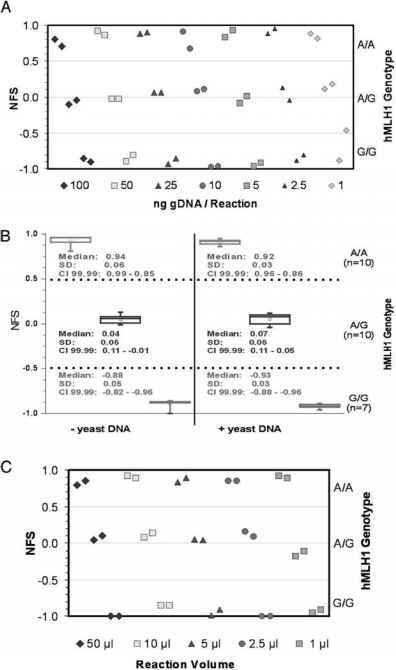 For intersample precision, 10, 10, and 7 individual gDNAs for hMLHl genotypes A/A, A/G, and G/G, respectively, were amplified and measured by FCS for 3 x 3 sec each at both 543 and 633 nm. Mean amplimer values from triplicate measurements were used to calculate individual NFSs. All precision experiments yielded fully reproducible results and the NFS values showed a narrow distribution for each hMLHl genotype (Fig. 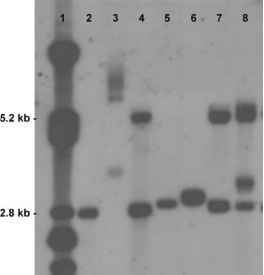 2E), thus indicating the high reproducibility and precision of GALIOS™ genotyping. Accuracy, reproducibility, and precision of GALIOSTM genotyping were highly identical when FCS measurement time was reduced to 1 x 2 sec at both 543 and 633 nm (data not shown).